The kids and I LOVE kombucha and all the health benefits it provides, but we don’t love the amount of sugar. Our whole family eats a low carb diet since Zola and I both have Type 1 Diabetes and eating low carb has been an incredible way to keep our blood sugar stable before, during, and after meals. We don’t experience the spikes in blood sugar we used to and we definitely don’t fear the roller coaster of highs and lows. Since switching to this way of eating, it’s been so fun to find ways to make low carb version of things we used to eat! Since we haven’t found a way to make a sugar free kombucha, because making kombucha requires regular sugar in order to work, we set out to make something that tastes similar and that’s also great for you! So we made an apple cider vinegar drink and it tastes pretty darn similar to kombucha! By adding a few drops to your drink, you get so many health benefits and it makes your drink taste especially fresh. This drink is the kick start to my day each morning and gets my booty in gear! I give you…”The Funny Drink” as Ollie calls it. Because his mouth feels funny from the La Croix. *I use the lime or lemon flavored La Croix, but because that’s what we have in the house. Most any flavor will do, or even just plain club soda. Or you can use water if you don’t have anything fizzy on hand. 1. In a glass, add lemon juice and blackberries. Use a spoon to mash the blackberries against the wall of the glass (Because we make this drink every day, I have pre-blended blackberries and lemon juice so it’s already in mashed up form). 2. 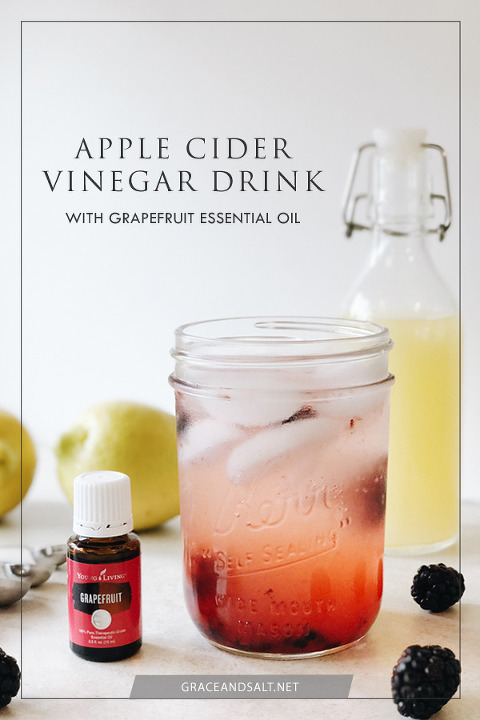 Add apple cider vinegar and liquid stevia. 4. Pour La Croix over ice. If you need to get yourself some grapefruit oil, you can do that HERE. Grab yourself a premium starter kit, and all the vitality oils are great for adding to drink or cooking with. Shoot us a message from the contact form if you have any questions about essential oils, what our favorites are, or how you can make some extra money simply by sharing how oils have benefited you and your family.